I was assisted by Bill, the Jeep manager, and John B., a sales person there. They were both amazing. My boyfriend had purchased a car from them previously and had worked with John. He was super wonderful and helpful then that we decided to go back to get my car. My car was recently totaled and he was extremely instrumental in purchasing the right car for me. The team there was able to locate the color I wanted and get it to me quite quickly! I truly appreciate the service representatives treating me with respect, they listen to my concerns and respond accordingly, never making me feel foolish. Service staff was wonderful. Explained everything clearly and showed me work that needs to be done. Cost unfortunately above my means. Thank you. A great dealership with great mechanics and sales staff. 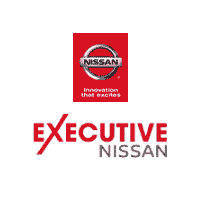 Overall experience at Executice Nissan was excellent. Great prices, and the facility is spectacular. Wait times and approvals took more time than we liked but it was worth it. My girlfriend walked out with the Maxima that was in the showcase and she couldn’t be happier. Brayan was outstanding from beginning to end, and was very attentive to us the entire time! I went in to turn in a lease and sign a new one. Dennis was very helpful during the entire process. The Business manager was professional and explained every document very thoroughly. I would recommend stopping in if you are in the market for a new car.